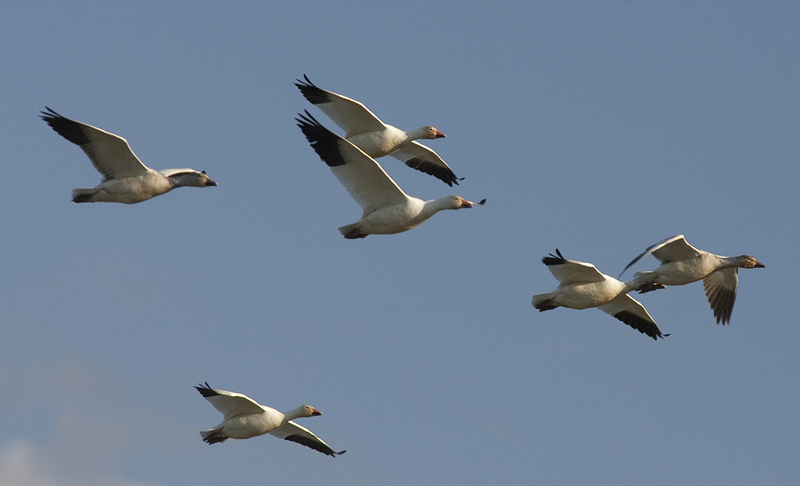 Every year about 100,000 snow geese return to Wrangell Island off the north coast of far eastern Siberia to breed. In August, as soon as the young are ready to fly, the birds move to the mainland to fatten up along the coast. A few weeks later they depart and start heading southeast across the Bering Strait, Alaska’s Seward Peninsula and the Yukon River delta. They then cross the Alaska Range and follow the coast down until they reach the terminus of the Fraser River in late September or early October. About half of the flock stops only for a short while before resuming their journey to their final winter destination in northern California. But about 50,000 stay and feed along the mouth of the Fraser on saltwater segdes and grasses. By mid-December, they have depleted this resource and the birds take wing again to fly about seventy miles south to the the Skagit River in Washington State. 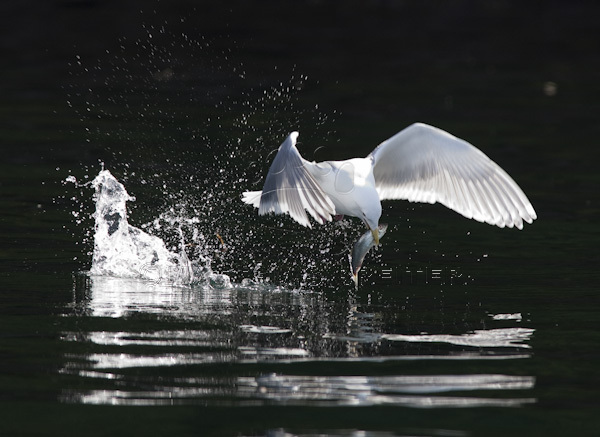 The birds spend the nights on shallow Skagit Bay. It is a spectacle to behold when at sunrise thousands of geese rise simultaneously off the saltwater to fly to the fields nearby for breakfast. In late February, they return to the Fraser for a few more weeks of feeding to gain weight for the long trek back to the Arctic. Finally, in April, after spring has arrived, they take off, wave after wave of the white travelers climbing high into sky before turning north and fading into the horizon. Dark clouds rush in from the west. On the wings of the storm, sea gulls race against the brooding sky. Just hours earlier, when faint wispy clouds first announced a change in weather, the steep mountains cast a perfect reflection on the glassy surface of the fjord. Tides running against a stiff breeze have meanwhile transformed the tranquil waters into a churning stretch of cresting waves. The heads of bald eagles paint white dots on the otherwise uniformly green canvas of forest, their bodies swaying as the trees they are perched on bend in submission to the gales. A Steller’s jay flutters noisily among the underbrush, announcing my presence to other forest dwellers. A black-tailed deer appears at the forest edge, glances in my direction and then melts back into the deep shadows among the trees. Off shore, on some rocks barely breaking the surface, several harbor seals lie hauled-out. As whitecaps crash against the outcrop, salty spray envelopes their bodies. In a sheltered bay, a blue heron stalks its prey. In the branches hanging above the water, kingfishers sit in ambush. A few wing beats away, a small river casts its tannin-stained load into the ocean. The salmon have started running. Dark shadows fight the strong current in unbroken succession to reach the spawning grounds beyond the rapids a few winding miles upstream. Both black and brown bears, in a rare display of tolerance for each other, gorge themselves on the seasonal overabundance along the watercourse. Eagles, crows and ravens argue over the scraps falling off the bears’ dinner table. A family of river otters, residents of the lower part of the river, join the feast. And occasionally, even the most elusive of denizens of this untamed land, the wolverine, visits the banquet prepared by nature. As if a faucet is opened wide, the rain begins to pour. The opposite side of the sound vanishes behind a curtain woven by fine strands of falling water blowing in the wind. Sheltered by the dense canopy above, my back supported by the base of a giant spruce, I sit between its roots and admire the forces unleashed. Off the northwestwest coast of North America, in the shadow of lofty peaks, where the land peters out into the vastness of the Pacific, chains of islands lie separated from the mainland by a maze of narrow passages, deep fjords and long straits that funnel the wind and currents. Stitched together into a winding and twisting ribbon of water, these channels form a protected sea route that connects the ports and civic centers lining the shores of Puget Sound and the mouth of the Fraser River in the south with Skagway at the head of Taiya Inlet at the top of Alaska’s Panhandle in the north. During the gold rush, when ships of all sizes and shapes transported tens of thousands of stampeders up to the start of the Chilkoot trail and the new El Dorado on the Klondike beyond, this seaway was given the name “Inside Passage” to distinguish it from the alternative route along the outside on the storm-battered open Pacific. Today the term is often used more broadly, referring to the ocean and islands around the passage itself as well. In total, the entire area encompasses 40,000 miles of shoreline, several thousand islands, countless islets and stretches over 1,000 nautical miles from north to south. Matthias Breiter, biologist, author and award-winner photographer par excellence, opens a mesmerizing window on the awesome beauty of a natural treasure that is the INSIDE PASSAGE which encompasses 40,000 miles of shoreline from north to south. This protected sea route is a jewel among the natural treasures of the world due to its scenic grandeur and the profusion of life along its shores. As well, it is one of the last frontiers of ecological beauty still left intact by man. His dreamy and misty landscapes are suffused with a dazzling light. Dreamscapes and sunsets low on the horizon on the snowy mountains, the hills on the water shimmer. Of course, this last frontier is still inhabited by wondrous sea life such as the humpback whales, orcas and dolphins, and shore animals and birds, bears, wolves, ducks and hummingbirds. Still birds and birds caught in flight, or eating their “lunch.” On page 199, he has taken an amazing picture of a rufous hummingbird resting during a rain storm on a flower stalk of cow parsnip. This is quite a feat as hummingbirds very seldom stay still in one place. He must have a very sophisticated shutter. Lugging such photographic equipment in the wilderness must have been a feat in itself! From cover to cover there are many photo scenes filled with a great deal of depth and detail that caught my fancy including the Humback whale breaching near Juneau, Harris River, Prince of Wales Island, Tongass National Forest, Anan Creek in Flood where we see high river levels reduce the fishing success of bears, Misty Fjords National Monument that is also called “The Yosemite of the North, Peregrine falcons that are considered the fastest bird on earth and they can reach 200 miles per hour in a hunting dive, bald eagles swooping down to a spawned-out chum salmon along the Chikat River near Haines Alaska and the list goes on and on, far too many more to mention. As well, Matthias Breiter gives us a historical synopsis on who were the inhabitants of these faraway temperate rainforests. To produce this gem of a coffee table book, he had to take long stretches of time away from his family. He sure was forgiven for his absenteeism when they saw the results of his wanderings. 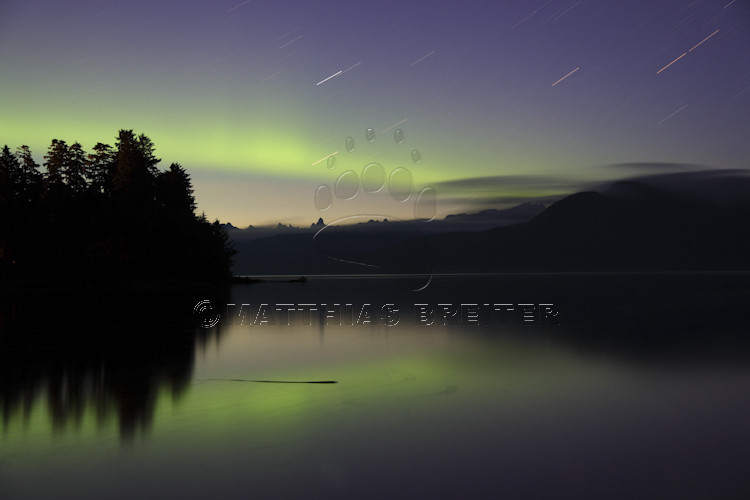 Matthias Breiter is to be commended on this colorful reminder that we still have ecological treasures North of Canada. As he so aptly put it, The Inside Passage is more the sum of its features. Above all, it is a gift to all mankind. Let us hope that it will stay this way forever. Inside Passage is the seafaring route on that goes between the northwestern coast of North America and the outer Pacific islands. The passage has for over a century been used as the main commercial and cultural passageway that connects the continental United States with Alaska. This route came into prominence and got its name in the late nineteenth century as the Alaskan gold rush brought countless adventurers seeking fortune. Inside Passage extends from the Alaskan panhandle in the north to Washington State in the south. In recent times the term Inside Passage has come to denote not only the sea route, but also all of the adjacent islands and mainland areas. This is an enormous area of almost unspoiled natural beauty and has become one of the most desirable tourist destinations. Matthias Breiter’s book “Inside Passage” is a visually stunning coffee-table book that goes well beyond what one can expect from this genre. The photographs are incredibly crisp and beautiful and they do the justice to this astonishing area. Breiter also provides a lot of useful information about the Inside Passage, especially when it comes to the biodiversity of this region. The writing is inspiring and easy to read, with a lot of personal insights. The book’s landscape format is particularly suitable for, well, pictures of landscapes. Some of the inside spreads are among the most beautiful ones I have ever seen. This is a great book about a remarkable region. It will inspire wanderlust in all true nature lovers. Short of setting out on a trip to visit the Inside Passage though, this book is the closest that one can get to appreciating its otherworldly beauty. With the exception of pregnant females, polar bears do not hibernate in the winter, but roam across the sea ice in search of food. Polar bears go into a state of ‘walking hibernation’ during the summer months – they do not enter a den but their metabolic rate is reduced. 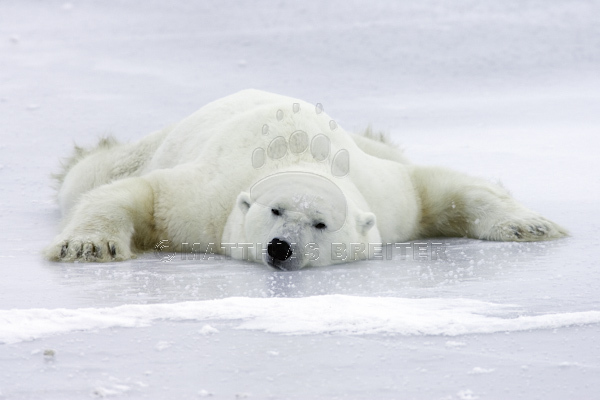 They can switch readily between their active state and walking hibernation based on the availability of food- an ability that is exclusive to the polar bear. Contrary to popular belief, it is not the cold temperatures that drive black bears and grizzlies into hibernation, it’s the lack of food. Bears in the zoo will not go into hibernation during the winter if they continue to be fed. Bear gall bladders are used in traditional Oriental medicine to treat jaundice, abdominal pain and distention, often caused by gallstones. Research has revealed that bear bile contains a substance called ursodeoxycholic acid (UDCA), which will dissolve certain kinds of gallstones without causing substantial side effects. Today UDCA is produced synthetically for use in hospitals and as a prescription drug. A bedridden person will suffer from muscular atrophy within a short time – weightlessness in space causes the bones of astronauts to weaken – even other mammals show a continuous loss of body protein when fasting – how do bears manage to stay curled up in their dens for months, and yet experience little loss of muscle mass or bone strength? “…How bears maintain bone density is unknown. It is hormonally related, but how the biochemical processes work has yet to be discovered. Maintenance of muscle mass is accomplished through an almost complete recycling of metabolic waste products into proteins. This also prevents metabolic waste from accumulating and reaching toxic concentrations. we need to drink and urinate to flush nitrogen compounds out of our system. Otherwise, altered pH levels in the cells would cause our metabolism to collapse. The kidneys are in charge of detoxifying the body, and people with kidney disease or kidney failure depend on frequent dialysis to stay alive. If we could understand how bears recycle their metabolic wastes, the lives of many could be improved. Matthias is going on tour! This year we have planned a 3 week Christmas tour starting the last week of November. The tour will begin in the north – Fairbanks, Alaska – and work its way south along the west coast all the way to Port Townsend, Washington. 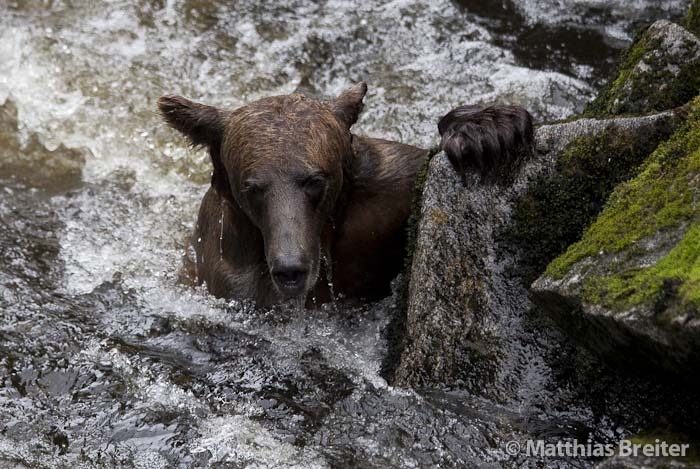 Matthias will be promoting his newest book, Inside Passage, which won gold at this year’s Independent Book Publisher Awards, along with some of his other popular titles – including: Wild Alaska, Bears of Katmai, and [Bears] A Year in the Life. Don’t miss the opportunity to meet Matthias Breiter in person and purchase an unforgettable Christmas gift for a loved one! The following is a tentative itinerary of the tour…if you think your town should be on the list, email us and we’ll do our best to make it happen! 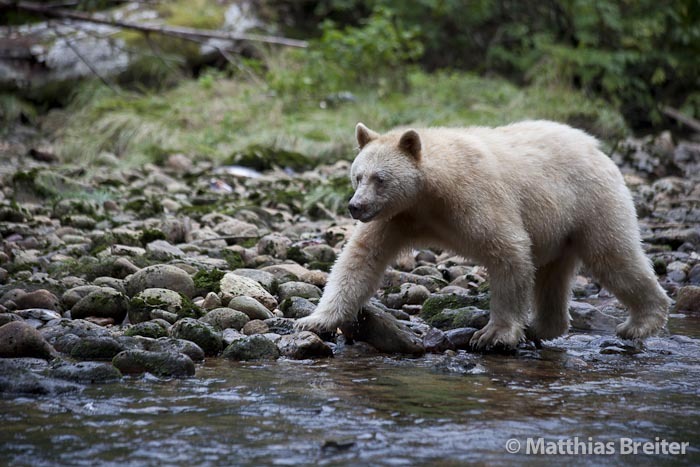 The Spirit Bear or Kermode Bear – Why Are They White? The spirit bear owes its existence to a recessive allele, a mutation in a pigmentation gene. It is the same gene that produces the yellow-blonde coat in golden retrievers. Because of small founder populations increasing the chance of inbreeding, and limited exchange of genetic material with the outside world, this gene has become widespread on the islands. Two-thirds of the bears on Princess Royal Island are carriers of the gene. However, a cream-colored cub is born only if both copies of the gene on its chromosomes consist of the recessive allele. Thus, following Mendel’s Law of heredity, if both parents are carriers, the mating of a black female and a black male may result in a mixed litter of both white and dark cubs. And a Kermode female will have exclusively black cubs if her partner is not a carrier. The indigenous people of the region know these bears as Moksgm’ol and hold them in high esteem. The animals have a prominent place in the mythology of local First Nations. From Matthias Breiter’s book Inside Passage. Click on the link below to view a short video about the legend of this mysterious bear. The Legend of the Spirit Bear and the Land and People it came from from Twyla Roscovich on Vimeo. Sea otters have made a huge comeback in recent decades. They were almost wiped out completely by the end of the nineteenth century due to the fur trade. Today, rafts containing several hundred sea otters can be seen around kelp beds behind Drake and Willoughby Island in Glacier Bay. However, populations fluctuate greatly. They are still reclaiming their former range. In their absence, their food sources, including sea urchins, exploded with dire consequence to kelp forests. This had an impact on the reproduction of small feed fish, which are important to salmon and whales. 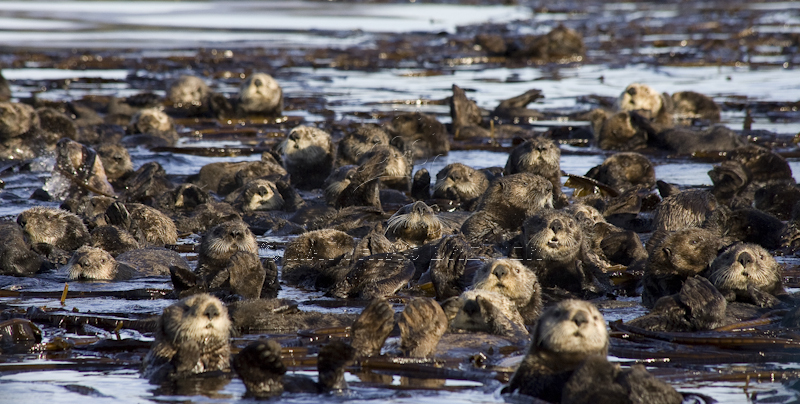 Due to an unnaturally high abundance of prey, sea otters tend to overharvest an area and move on when little is left, leaving a depleted seabed behind. This pattern of extremes will continue for quite some time until a balance is reached again. The longterm health and productivity of these marine ecosystems benefits greatly from the presence of these playful and endearing creatures. 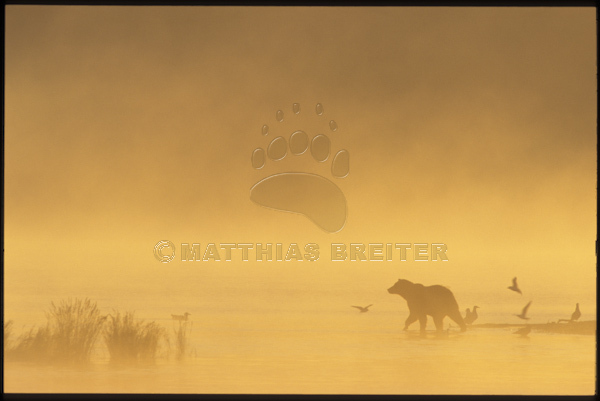 To read more check out Matthias Breiter’s award-winning book Inside Passage with stunning Alaskan wildlife photography. 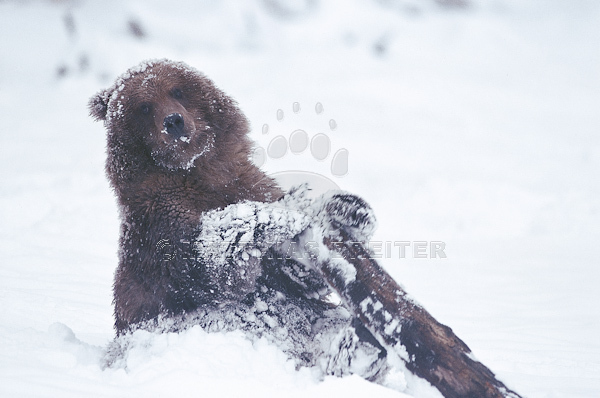 …If push comes to shove, the brown bears are dominant but mostly a fragile truce prevails. [Referring to brown bears and black bears fishing for salmon in the waters of Anan Creek south of Wrangell, Alaska] In times of overabundance, strife over a copious resource is a waste of effort. Still, black bear females, in particular females with young, usually abandon their fishing spot and leave the river or seek shelter up high in a tree when the bruins appear on the scene. Some juvenile brown bears apparently regard it as good sport to chase their smaller cousins. Mature male black bears generally stand their ground against these hooligans. 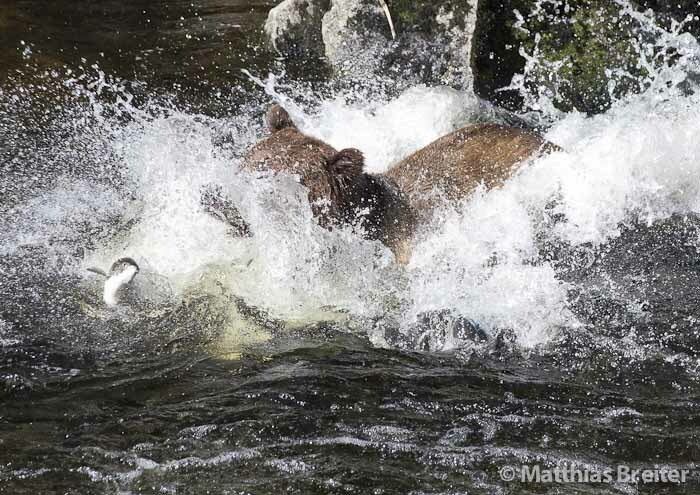 At the peak of the salmon season, between mid-July and mid-August, as many as fifteen bears can be seen fishing along the stream at the same time. Individuals who are skinny at the start of the fish run are often plump by the end of it, adding as much as two pounds of fat to their stocky frame per day. Salmon lie piled up in dense rows in the pools below small waterfalls, waiting for their turn to leap the obstacles in the river. Bears line the river, staring at the water and the promised meal contained within. Fishing techniques vary between individual bears and also between the two bear species. Some hurl themselves into the midst of schools of fish, others dive below waterfalls, again others simply stand midstream hoping for a disoriented fish to get within their reach. Generally the brown bears take a more active role in the pursuit of their prey, leaping into the stream and chasing fish into shallows. 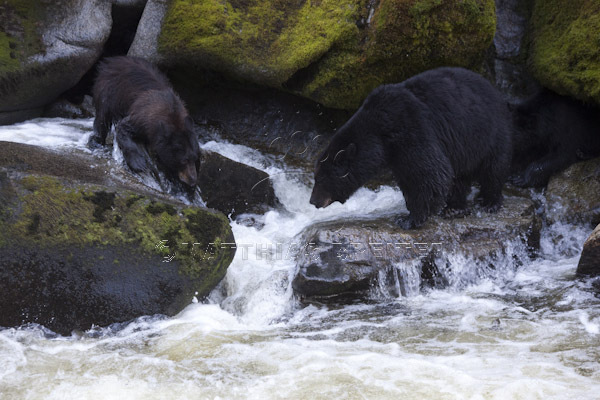 Most black bears, possibly as they feel more vulnerable, wait on the water’s edge for the opportunity to quickly grab a fish and retreat back into little caves among the boulders piled up next to the river. Cubs learn from their mothers. Fishing techniques get passed on to the next generation and favorite fishing spots get reused by daughters and sons. Brown bear cubs sit right on the bank of the river while their mother fishes. By comparison, the offspring of a black bear female are more cautious and watch her fishing from high in a tree or sit at the base of one, always ready to scramble up the trunk to safety. The river is a dangerous place for young bears. A lack of caution, a moment of inattentiveness, can have fatal consequences. For cubs, the salmon run is a stressful, scary time of the year, a time when they have to weigh boldness against caution. Sows only feed cubs that demand a meal. A cub that is too shy, won’t get much food; one that is too courageous may not live to see the fall. 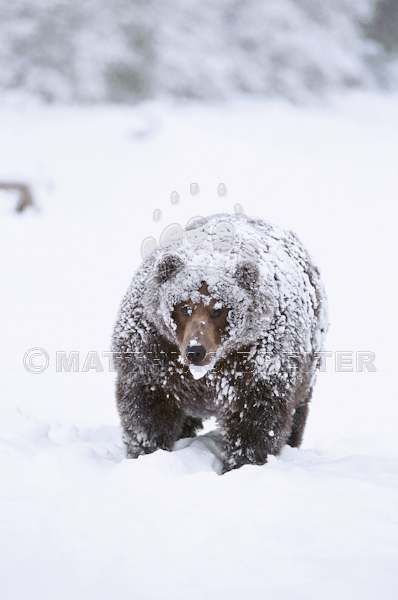 From Matthias’s book on bears and Alaskan wildlife – Wild Alaska. View images from the book.